A friend of mine was purchasing a selection of hurdy-gurdy music, and it got me thinking of great Hurdy Gurdy recordings. First of all, a disclaimer: As much as I love traditional French music, the kind of hurdy-gurdy playing that really excites me are the albums where performers create something new and personal, with more relevance (presumably) to the modern communities they live in. This might mean playing with other unusual or underused instruments (clarinet, button accordion), or playing in a band, sometimes even with electronic instruments. Not all of those experiments can be called a success, but some of them stand the test of time. These CDs are becoming easier and easier to find as iTunes and other services begin to take notice. I’ll list Amazon links for the albums when available, since these are DRM free MP3s that will play on any device, and can be listened to before purchase. As an aside, I use an online subscription service that lets me hear just about any recording on demand. As always, your opinion may differ, so please let me know what you think in the comment section below. Who have I left out? For further reference Alden and Cali Hackmann (Olympic Musical Instrument) maintain an exceptionally detailed discography of Hurdy Gurdy recordings at: http://www.hurdygurdy.com/info/disc.htm and I owe it to Alden’s hurdy gurdy mail list and the folks at the yearly “Over the Water Hurdy Gurdy festival for help discovering several of the disks listed below. 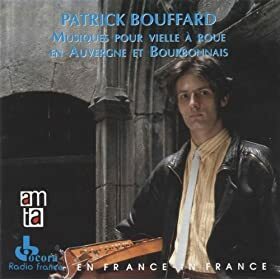 These are recordings which put the Vielle A Roue (the much more euphonious French name for the hurdy gurdy) in the forground. There are two living French players who top the list: Gilles Chabenat and Patrick Bouffard. Both are excellent. Fantastic playing, great arrangements, and traditional tunes make this a stand out recording and a great place to start listening. You can also listen to short snippets of the pieces without purchase. These are original and traditional tunes. They represent some of the finest modern arrangements for hurdy-gurdy and associated instruments (French bagpipes, violin, clarinet, etc.). 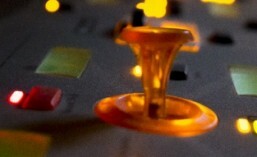 There are some vocals on the album which interrupt the flow a bit. Hurdy gurdy and button accordion in some insanely tight arrangements. Eaton is an award winning English player who first came to my attention from his participation in the English dance band Blowzabella (see groups below). I love this recording – the connection between Eaton and Cutting is palpable, the playing fast and the tunes excellent. Of course, you can sample the music before you buy. This is a new discovery to me, and to be honest a few months ago it would not have made it on this list. I’ve been playing the CD a lot in the last month, and have begun to to really like it. It’s filled with modern, complex show pieces that exercise the features of the unusual instrument that Jolivet plays, and at first I was put off by how busy it all seemed. He is clearly a great player, (and I love what he has done with Blowzabella in recent years) but I was put off by how chaotic and busy these tracks were. The disk has grown on me over time and I now listen to it regularly. I put him into the list as an example of a new performer who is still pushing the limits of the instrument. I found no sources for the CD but did turn up a number of fine You Tube videos. Here’s one: http://il.youtube.com/watch?v=JBI6eW5Eyt4&feature=related. 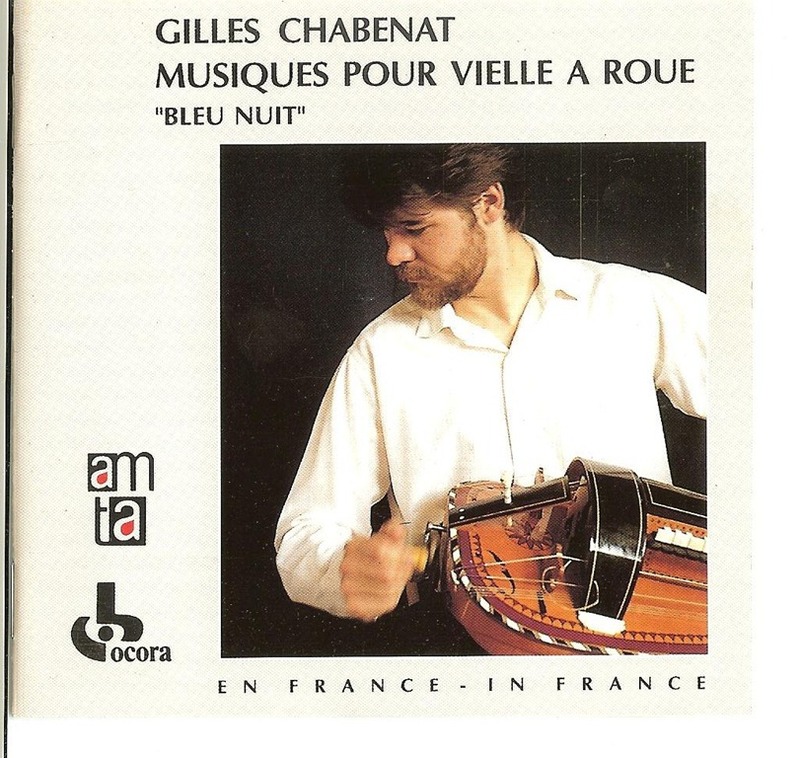 The maker of the unusual instrument on this CD as well as the instrument in the video is Philippe Mousnier. More information can be found on his site: Philippe Mousnier. 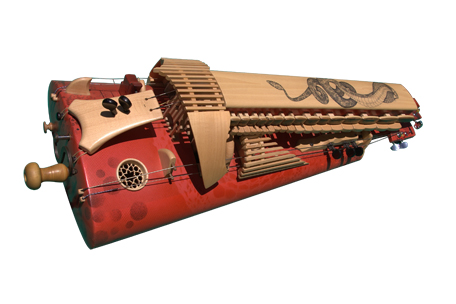 Another unusual instrument by Philippe Mousnier, from his online catalog. This is even more subjective. There are so many cds by so many great musicians, and there is no way that I could hear them all. But I still have opinions – don’t we all! If I miss a good one, let me know in the comments below. For me (as an English speaker) it all starts with Blowzabella. I encountered the band in 1979 in London (Several band members attended the London College of Furniture Instrument Building program in Whitechapel at the same time I did), and attended some of their dances in the basement of the Cecil Sharp house in London. The band transcends genre and ethnicity, mixing originals with traditional tunes from many sources. 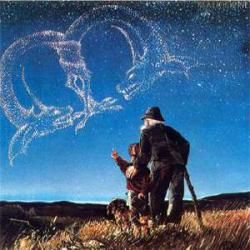 Many of their original tunes have become standards in the folk community. There is a new recording where the band gets back to their roots called Dance. 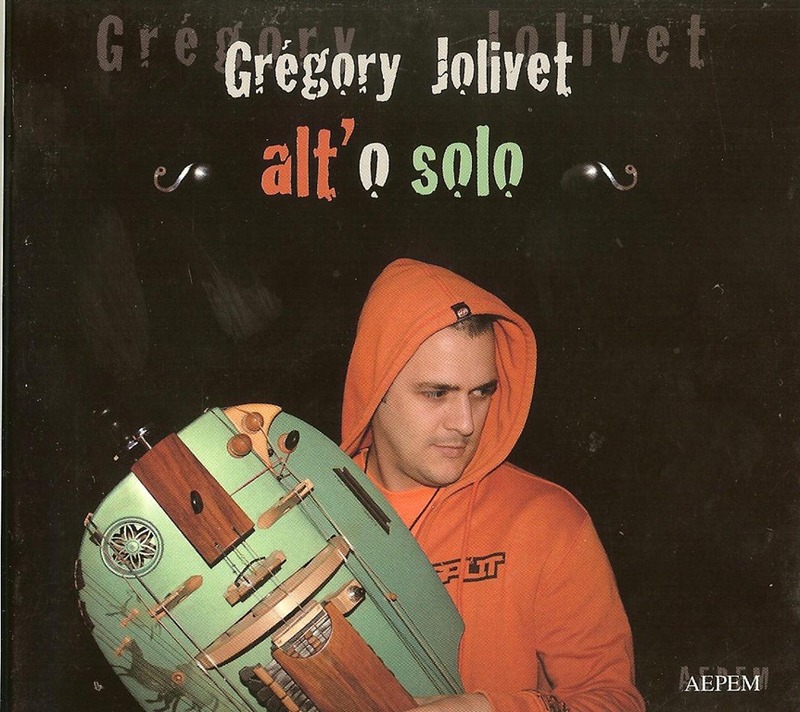 So many great hurdy gurdy players have played with Blowzabella: Starting with Juan Wijngaard, Sam Palmer, Nigel Eaton, and now Gregory Jolivet. Distinctive features are prominently placed hurdy gurdy and bagpipes, loud wind instruments like sax, often electric bass, and button accordion. 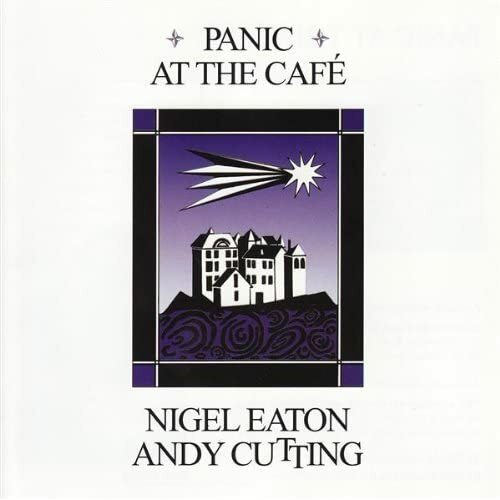 Accordion and hurdy gurdy provide the driving rhythm for the best dance tunes, particularly in the later recordings with Nigel Eaton and Andy Cutting. This is a collection from the earlier Blowzabella albums, and gives a good portrait of the band and it’s varied styles. 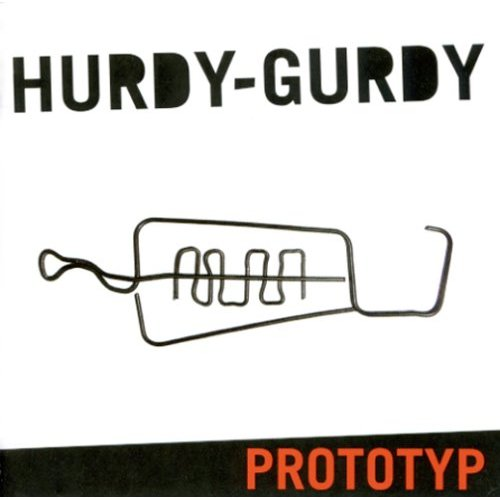 The hurdy gurdy is featured prominently on many of the tracks. Listen and be amazed by the Blowzabella wall of sound! Malecorne falls solidly in the camp of folk rock, and hails from the decade of 1975 to 1985 that was the high point of the genre. I’d go so far as to call it the best of any folk rock band – the instrumentation was creative and unusual, and the orchestrations and arrangements brilliant. What puts them on this list is the use of hurdy gurdy (and bagpipes) on many of the classic tracks. There is a compilation CD (legend) but I have not heard it, so I am just picking my personal favorite out of a field of great recordings. I don’t think that any of these CDs will disappoint. In fact, I see some odds and ends that I ‘m going to download as soon as I’m done writing this post! Nordic roots and very modern, almost techno arrangements of original and traditional tunes. The band promotes the instrument as a “medieval synthesizer”, generating percussive effects and odd sounds. This CD contains recordings that have been cut up and re-arranged into the pieces you hear. “Our world of wood, gut strings, cranks and laptops might seem pretty small, but we are proud of it” says Stefan Brisland-Ferner. The CD is available used from Amazon associates. Unfortunately no samples are available on line, and the record label NorthSide is not promoting it. This entry was posted in Great performances, history, Hurdy Gurdy, Traditional music. Bookmark the permalink. Is there any way you could share that Grégory Jolivet album? I’ve been searching everywhere, but can’t find it! It is a great album, and it’s a shame that things like this don’t get better distribution. You might try contacting the artist directly if you want to take the time – he is active on Facebook and seems very engaged. I’m sure you have already discovered the significant number of videos of him on YouTube. Wish I could help more! Hope that helps anyone else who stumbles on this great article in the future. That is great news – thanks for the link!